Mike Clark (far right) with some of his new best friends jamming at IBC 2014. In December 2013, a few of Mikey’s Juke Joint groupies (including myself) decided to head to Memphis for the International Blues Challenge (IBC) to support the Mike Clark Band and Tim Williams, both of who would be representing southern Alberta at the January 2014 competition. It was a truly amazing experience, not only did Williams win the competition as the best single/solo act and best guitarist, but I developed a whole new appreciation for the history of the blues and the culture of the south that produced it. This year’s Challenge happens January 20 – 24 with Calgary’s Mike Clark Band and Tim Williams again representing southern Alberta. One of the great things about visiting Memphis is their trio of music museums – Stax Museum, Rock ‘n’ Soul Museum and Sun Records. The STAX Museum blew both Brenda (not so much a blues or music keener) and I away with its campus that includes not only the museum, but a charter school and extensive collection. For anyone interested in the history of 20th century music in North America, this is the place to go. You will learn about the evolution and connections between numerous genres of music – blues, soul, jazz, Bebop, country, gospel, hillbilly, R&B, rock and Pop music. What I particularly loved about the museum is there is its air of authenticity as much of the history actually happened in Memphis or in the immediate area. STAX museum is located in an older neighbourhood, with a mix of both new and somewhat seedy buildings. The museum starts with a wonderful 20-minute film, after which you wander at your own pace through hundreds of displays that tell the story of the music with lots of memorabilia. The highlight was when I complemented an elderly, distinguished-looking man on his great tie. He thanked me and we got chatting about the museum and how he was visiting with his grandchildren who “wanted to see where their grandfather was” in the museum. Turns out I was talking to Harold “Scotty” Scott of the Temprees, whose gold record for “Dedicated to the one I love” and other band artifacts we on exhibit. One take away message I got from this museum was how the pain and hardship deeply penetrated the African American culture of the south and how they sought comfort and solace in their music. I would recommend anyone visiting the museum, also take an explore a few around the museum, it will reinforced the link between poverty, sense of place and blues music. The predominately black neighbourhood of empty lots, abandon homes, homes with what looked like religious shrines on the porches and numerous churches looked like many of the images we saw in the museum. In chatting with Andrew Mosker, CEO, National Music Centre (NMC), who is currently construction a new museum in Calgary, I was told they would be incorporating some of the lessons learned from STAX on how to engage, entertain and educate the public about music. Yet, I couldn’t help but wonder if the NMC could match STAX museum’s authenticity as most of NMC’s artifacts will be imported from elsewhere. Also a big shiny new museum located in a glitzy new master planned urban community seems diametrically opposed to places that are the catalyst for artistic creativity. Time will tell. One of the things that make Memphis' museums great is their authenticity, as they are telling stories that are both local and global. The Rock ‘n’ Soul Museum, created by the Smithsonian Institute and located downtown next to the arena provides an excellent overview of the history of Memphis area music from the 1930s to the city’s musical heyday of the ‘70s. The museum’s digital audio guide offers up over 300 minutes of information including 100 songs that you can listen to while surrounded by artifacts of the time. It is a total music immersion program not to be missed. Sun Records, located just outside of the downtown, is easily accessible via the tram and a short walk to the historic building. Like the STAX museum, I think you get a better appreciation for the history and the environment that produced the music when you walk the streets around it. The lobby of Sun Studio looks like a '50s diner. What is great and unique about Sun Records is that you get a personal tour led by a local musician. Sun Records, an American independent record label was founded in Memphis in 1952, by Sam Phillips and financed by Jim Bulliet. It was here that Phillips discovered and first recorded Elvis Presley, Carl Perkins, Roy Orbison, Jerry Lee Lewis and Johnny Cash. Phillips loved the music of African-Americans and wanted to bring that genre to a mass audience, which changed the world of music, but meant Sun Records struggled to be viable. The museum is full of artifacts and your tour guide has amazing stories to tell. But the highlight of the tour is to stand on in the recording studio where Elvis, Carl, Jerry Lee and Johnny belted out your favourite songs. The building just oozes history - I am sure I heard Roy singing. The modest entrance to Sun Studio. One of the many artifacts from the early days of Sun Studio. The recording studio is still used today. It looks like a rec room from the '50s. It is hard to imagine that this is place where the legends of '50s and '60s music created their hits here. Beale Street, truly one of North America’s iconic streets, is home to the International Blues Competition (IBC). The event utilizes 17 different venues along the street for the 250+ entries from around the world. The street is hopping with music from noon to the wee hours of the morning. For me, the highlight of the Challenge were the midnight jams at the Daisy Theatre (every night various musicians from the competition and past winners put on an impromptu concert, the energy was electrifying). There are certain art experiences that stand out in my life - seeing Baryshnikov dance from the front row of the Lincoln Centre (1984) and the Hermitage Show at the Winnipeg Art Gallery (1977) - and the IBC jams on Beale Street. Beale Street is animated by buskers and bands who provide great street entertainment. The International Blues Challenge midnight jam. No trip to Memphis for a blues lover is complete without a road trip to Clarksdale, Mississippi (90 minute drive), considered by some as “ground zero” for the blues. The entire city is a living museum complete with numerous historical plaques and a self-guided map. Clarksdale is home to the crossroads of highways 61 and 49 where legend has it iconic blues guitarist Robert Johnson sold his soul to the devil. You can also visit the McKinley Morganfield’s (aka Muddy Waters) cabin on Stovall Road. There are lots of tiny cabins still inhabited that serve as a reminder of the poverty that begat the blues. When in Clarksdale check out The Delta Blues Museum, WROX radio station on Main Street and all of the other historic sites around town, it will give you a whole new appreciation of how the blues was germinated. Ground Zero Blues Club opened in 2001 in an old warehouse building with “manufactured authenticity” complements of an old couch and other bric-a-brac on the porch and the tradition of graffiti-like visitors writing of their names anywhere they can find space. names of people who have been there on the walls. We arrived mid day (nothing was happening), but we did manage to get on stage and pretend we were performing. In chatting with Holger Petersen (veteran CBC and CKUA blues broadcaster), after his talk about the history of the blues at NMC a few years back he told me Ground Zero was one of his favourite places to listen to the blues. You could easily spend an afternoon wandering the streets of Clarksdale, checking out the museum, eating dinner and listening to an act Ground Zero and maybe even book yourself a room at the Riverside Hotel, established in 1944, where the the likes of Robert Nighthawk, Sonny Boy Williams and Ike Turner had been guests. It truly is a sacred place. Ground Zero Blues Club looks like it was part of Clarksdale's heyday, but in reality it didn't open until 2001. It has established itself as the premier place for blues performers to play when in the area. Panels like these are located throughout the city, creating an informative self-guided walking tour. Clarksdale has numerous music related stores that are fun to explore. It is a great place to flaneur - you will find everything from the charming Greyhound bus depot to the Tennessee Williams historic district of mega-mansions from the early 20th century. Tennessee Williams grew up in Clarksdale. Barry (another Mikey's groupie) and I on stage at Ground Zero Blues Club. No trip to Memphis is complete without attending a Sunday morning Gospel Church service. While many trek to the well-publicized Al Green church service near Graceland, we were fortunate to notice during our wanderings that at the end of Beale Street is the First Baptist Church (built in 1880, it is believed to be the first brick-constructed, multi-story church built by African Americans). We like authenticity so this seemed like the perfect choice. So on Sunday morning, when many IBC revellers were still recovering from their Saturday night festivities, we headed to church. Wanting to be respectful, we tried toquietly walk in and sit at the back, but that was not to be. We were immediately welcomed like long lost family, hands were shaken, we were given a program, and by the end hugs were shared and we were part of “the family.” I have never experienced a more friendly welcoming. At the beginning of the service, all-newcomers were welcomed by name and where they were visiting from. We were asked to stand to be recognized and invited to say a few words. Then amateur singers and preachers started to perform building to a crescendo with a large female choir and professional passionate preacher that made both your body and soul shiver. I don’t think I have ever heard so many AMENs in my life. Initially planning to only stay for 30 minutes or so, we were mesmerized we stayed for the entire two-hour service. We were even invited to join them for lunch afterwards. It was a magical experience. Amen! Summer is Calgary’s busiest tourist season. It is when family and friends love to come to Calgary, not only for the 10 days of Stampede, but for all of July and August. However for most Calgarians’ the top-of-mind place to take visitors is to Banff and the mountains. I would like to change that! I thought it would be fun to put together a blog of postcards reflecting the many things to see and do in Calgary with tourist this summer and anytime. I have tried to find “everyday” things to see and do, not just the obvious attractions – Glenbow, Calgary Tower, Heritage Park, Zoo, Science Centre, Calaway Park, Chinook Centre or IKEA (now that Winnipeg has its own IKEA, you are going to have to find someplace else to take visiting Winnipeggers). I have tried to identify “off the grid” uniquely Calgary spots versus obvious touristy things. I have also tried to identify a diversity of things to see and do that will appeal to a variety of interests. And, most of the things are FREE! I hope these “everyday tourists” postcards from Calgary will be a catalyst for Calgarians to spend more time exploring Calgary with their visiting family and friends this summer, or anytime of the year for that matter. Calgary has several great pedestrian districts - Kensington, Inglewood, 4th Street and 17th Avenue. This is the little "no name" plaza on 10th street where buskers are entertaining people passing by - it is always animated and didn't cost a half million dollars to create. These streets are great places to do some local shopping, sample some of Calgary's great cuisine scene or one of our craft beers. All of these streets have great patios for relaxing and people watching. This is Canada's Sports Hall of Fame at Canada Olympic Park. For anyone who is interested in sports this is a must see - lots of hands-on activities. While you are there, you should wander around perhaps bring your bikes and do some mountain biking or one of the other activities available. Did you know Calgary is also home to Canada's second largest military museum? It is also worth a visit, I have never heard of anyone who was disappointed. Calgary has one of the world's largest urban pathway system - over 750 km. While you are walking, running or biking along the north side of the Bow River at the Louise (10th St) bridge you should consider stopping and checking out the new Poppy Plaza - Calgary's newest monument to Canada's war and peace keeping efforts. Who needs to go to the mountains when Calgary has over 5,000 parks including two of the largest urban parks in the world - Fish Creek Park and Nose Hill. This is Edworthy Park home to the Douglas Fir Trail - perhaps Calgary's quintessential trail. Floating down one of Calgary's two rivers is a great way to spend a summer day with visiting family and friends. You could even try your hand a fly fishing as the Bow River is one of the best fly fishing rivers in the world. Calgary has many historical buildings and districts in the inner-city, from the majestic early 20th century sandstone schools to old city hall. Stephen Avenue (8th Street SW) from Centre St to 4th St. SW is a National Historic District and Inglewood has a heritage Main Street. If you have a history buff visiting you will want to be sure to take them to our two historical districts, along with maybe Fort Calgary, Glenbow and Heritage Park. A great resource to have is "Historical Walks of Calgary" by Harry M. Sanders, it offers 10 different self-guided tours of Calgary historical communities in and around the downtown. Or print off the City of Calgary's self-guided tour of Stephen Avenue and you are all set for a half-day of exploring. (Photo credit: George Webber, one of Canada's most respected photographers). When in Calgary, eat like locals do? Chicken on the Way and Peter's Drive-In are two of Calgary's iconic eateries. Click here for: Top Ten Places to eat like a local? Explore your own neighbourhood, on foot or on bike - you might be surprised what you will find. We love to take visitors to our favourite local spots like this musical fence. Calgary has a great cafe culture. Caffe Rosso located in interesting places like the Old Dominion Steel site in Ramsay is just one of the many independent cafes. Learn more: Calgary's cafe scene. Riding the train can be a fun and an inexpensive way to spend a day, especially with young children. You can buy a day pass and hope off and on as much as you like. You can combine a train trip with exploring downtown, or perhaps a trip to the Zoo or the Science Centre - both are easily accessible by the train. This is the Sunalta LRT station just outside of downtown, from this station you could walk to Mikey's Juke Joint for their famous Saturday Afternoon Jam or to Heritage Posters & Music to browse their wonderful collection of posters, records and music memorabilia. Calgary has a festival pretty much every weekend through out the summer, including Global Fest fireworks completion in lovely Elliston Park, August 14 to 15, 2014. If your visitors are into music you might want to suggest one of Calgary's live music venues. You can catch Tim Williams, winner of the 2014 International Blues Competition (solo/duo) and best guitarist for free on most Tuesday evenings at Mikey's Juke Joint or on Saturday when he hosts an afternoon jam at the Blues Can in Inglewood. There are live music venues throughout the city. Best place to find out what is happening and where is to get the Swerve Magazine in the Calgary Herald every Friday. If your visitors are into history or reading, bookstore browsing is a fun activity. Calgary is home to one of the Canada's most unique bookstore - Aquila. Located at 826 - 16h Avenue, right on the TransCanada Highway it specializes in polar expeditions, Western Canadiana and Canadian Pacific Railway. Yes those are two authentic Inuit kayaks hanging from the ceiling. Pages in Kensington is also a great bookstore with lots of readings and FairsFair is a great used bookstore and has several locations. If you really want to show your visitors you are "hip" and "tin he know" you might want to take them to Salvage in Ramsay, just down the road from Cafe Rosso and not very far from the Crown Surplus and Ribtor in Inglewood. You could easily spend a day pretending you are on the set of Canadian or American Pickers TV show. Anyone into retro or vintage artifacts or antiquing or thrifting would love these places. If you are interested in walking tours the City of Calgary’s website has several, including cemetery tours. You can also pic up David Peyto’s Walking tour books or the iconic "Historical Walks of Calgary" by Harry M. Sanders. You can even book your own private tour with Calgary Walks. I am always interested in new ideas and places to explore, so please send me your suggestions for Calgary Postcards and I will add them to this blog or perhaps create another one. Richard White, July 3, 2014 (An edited version of this blog appeared in the Calgary Herald's Neighbour). How can Calgary’s 17th Ave BRZ (Business Revitalization Zone) be the newest and oldest at the same time? It is the newest in that it was rebranded in March 2013 as RED (Retail and Entertainment District), and the oldest as it was the first BRZ formed in 1984 when it was known as Uptown 17th. Today, the 12 blocks of 17th Avenue between 2nd Street SW and 14th St SW is one of Canada’s best retail/restaurant streets. It offers a healthy diversity of flaneuring fun with about 70 restaurants and bars (including some great patios), 70 fashion and gift shops as well as 17 salons and spas. 17th Avenue became internationally famous in 2004 when it was dubbed “The Red Mile” during the Calgary Flames’ run at the Stanley Cup. After every playoff game win or lose, 50,000 fans in their red Flames jerseys would gathered along 17th Avenue, creating an impromptu street party with a Mardi Gras-like atmosphere. The RED mile during the Stanley Cup playoffs. RED is the urban playground of the young and restless GABEsters (geologists, accountants, bankers, brokers and engineers) of the Beltline and the rich and famous of Mount Royal and Scarboro. 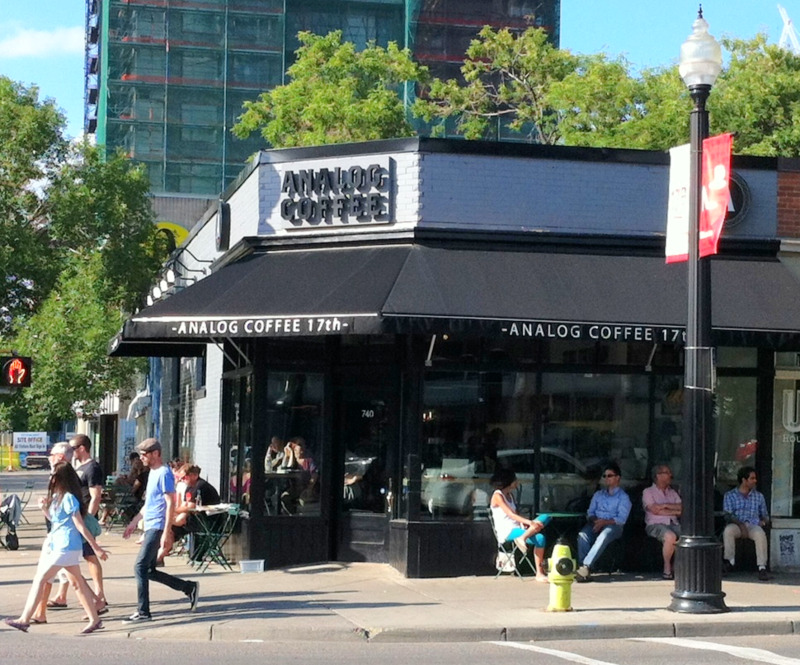 It is also home to one of Calgary’s newest trendy coffee shops (Analog Coffee) and one of its oldest (Café Beano). This area is also popular with Calgary’s foodies who love to shop at Janice Beaton’s funky back alley cheese shop or meet up for a meal at her restaurant FARM. Brava Bistro is regularly on the top 10 restaurants in Calgary list. For those looking for something more informal, there is Tubby Dog. Other foodie hot spots include Market, Cibo, Una, Ox & Angela, 80th & Ivy, Borgo and Menchies. And don’t forget Model Milk, was #2 on enRoute magazine’s list of the top 10 new restaurants in Canada, in 2012. If you are looking for funky eyewear, Brass Monocle, Eye Candy, Eye on 17th and Sol Optix offer the latest international eyewear. Other popular fashionista spots include Primitive Culture, Gravity Pope, Reid’s and Rubaiyat. The Ship & Anchor patio on 17th Avenue is animated even in the middle of March. Inside the Ship & Anchor is one of Calgary's most popular live music venues. In 2008, 17th Avenue also gained some media attention as Tomkins Park became home to Calgary’s first automated public toilet – an Exeloo Galaxy. Ranked #55 in Diana O’Meara’s book “Alberta Book of Musts: Places Every Albertan MUST See,” it is used about 40,000 times/year. RED as a vibrant cafe scene. The sidewalk ballet on 17th Avenue SW. Window licking fun is critical to being an urban playground. One of Calgary’s architectural gems is the Devenish Apartments (908 – 17th Ave S.W.) built in 1911 designed by architect Alexander Pirie. To maximize the number of suites (57), the building originally had no bedrooms – a Murphy bed pulled down from the living room wall. Amenities included the building’s sunrooms, steam laundry and odorless garbage incinerator. In 1980, it was sold and renovated into the Devenish Design Centre. RED’s other historical gem is the Anderson Apartments (804 - 18th Avenue S.W. ), once home to Jann Arden and inspiration for her song “Living under June.” As well, her video “Insensitive” was filmed here. The Baroque, H-shaped building was designed by Roscoe B. Witten in 1913 to allow for the maximum number of windows for each of its luxury apartments. The building boasted a marble rotunda, a grand stairway with 12-foot ceilings, as well as all-night elevator and telephone service. Most of this information was sourced from Harry Sanders book “Historic Walks of Calgary.” This book is a great read and widely available in Calgary bookstores. The Calgary Stampede MEGA Makeover Has Begun! After the devastating flood of 2013, the Calgary Stampede had some tough decisions to make as the Board and Management pondered its future. Rather than just fix the place up, the Stampede commenced with its mega-million dollar makeover plan. Calgarians won’t recognize this year’s Stampede Park. Almost 50% of the outdoor space has been reconfigured and several major new players are participating for the first time! Nine things to know about Stampede 2014…. The Great FUNtier is the name of the Stampede’s new Kids Zone. It has been moved to the area south of the Saddledome and north of the racetrack. The space, now 25% larger than the old Kids Zone, will allow for more greenery, easier stroller maneuvering and more seating. In addition to the kid’s midway, there will also be a mini Grandstand Stage for live entertainment. The location is also convenient to the family-oriented agricultural programming at the new Agrium Western Event Centre and the RCMP Musical Ride tent. Did you know that park admission is free for kids under 6? There is also free admission for children aged 7 to 12 on specially marked Coke, Diet Coke and Coke Zero in stores now. The Grandstand Show is getting a makeover by new Creative Director, Dave Pierce who was the Musical Director for Vancouver’s Winter Olympics' opening and closing ceremonies. Pierce, an Emmy Award winner, brings a new vision and energy to Grandstand extravaganza. The theme for this year’s show is “Barnburner.” The opening segment features Tom Glass (one of Alberta famous chuckwagon families) telling his family’s story using a series of mega comic book action figures. The costumes for Barnburner have been designed by Genvieve Cleary and built by Marco Marco Studio, famous for designing the costumes of Katie Perry and Britney Spears. The permanent stage is also being completely redesigned by Paul Bates who was responsible for Cirque Du Soleil’s “O” stage. It includes the latest in pyrotechnics and amazing stage effects capacity. The new stage will be one of Canada's most technologically advanced theatrical stages. The new $62 million Agrium Western Event Centre (AWEC) with its dramatic rotunda entrance designed by Calgary’s Gibbs Gage Architects, is just the beginning of rebuilding Stampede Park. 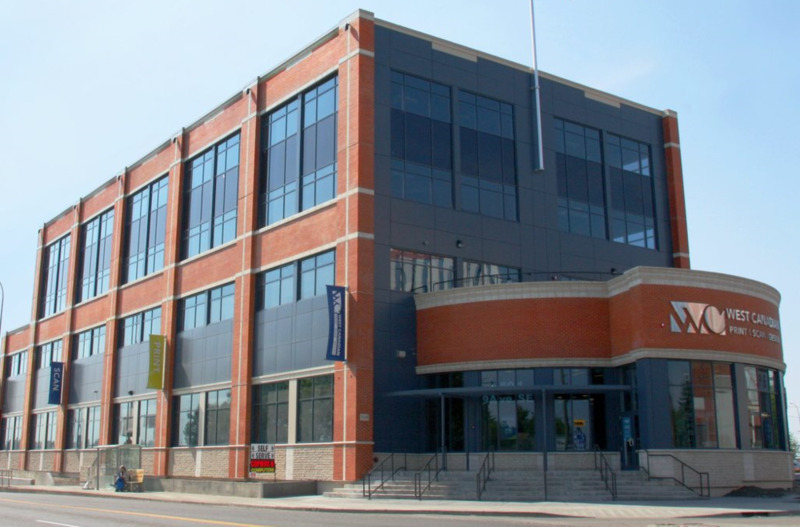 The new building which opened recently adds much needed, year-round event and trade show space as well as a classroom for hands-on school programs. AWEC has already hosted Canada’s largest ever 4H club gathering. Nashville North has moved “north,” closer to Cowboys Dance Hall tent and the Stampede Casino to create a “party zone” - some have already dubbed it the adult entertainment zone (good clean fun of course)! This could be an interesting precursor to the creation of the year- round Stampede Trail – a pedestrian entertainment-oriented street of retail, restaurants, pubs and clubs along Olympic Way (4th Street SE) linking it with East Village. “Sneak a Peek!” Paul Hardy has been engaged to procure some uber-chic 2014 Stampede merchandise, some of which is already available at Hardy’s Inglewood studio tucked away at Bay#5, 2510 Alyth Rd. SE. in Calgary's funky Inglewood/Ramsay community. “Go Big or Go Home” could be the theme of this year’s Stampede with the introduction of the 777-pound burger ($5,000) and the 125-pound hot dog ($1,000). Juicy’s Outlaw Grill is bringing the world’s largest grill (the size of a transportation truck) to this year’s Stampede. This is a first in Canada. Check out the video. Biggest Pop-up Patio? Triple B (Barbecue, Bulls, Beer) is also making its first visit to Canada creating a patio for you and 999 of your closest friends. With two mechanical bulls on site, it should make for great people-watching. WWW Food! Every year the Stampede brings some wild, weird and wacky food combinations to Calgary. This year is no exception. The Scorpion Pizza has to be the weirdest, followed closely by Deep Fried Cheezies, Polish Poutine, Porcupine Corn Dog, and Vicious Fish on a Stick. Did you know the Calgary Stampede is one of North America’s biggest music festivals? For the first time, the Dome is fully booked with shows every night by the likes of Shania Twain, Reba McEntire, Keith Urban and Calgary’s own Paul Brandt. In total Stampede 2014 includes over 340 musical performances at 15 different venues. 2012 was the Stampede's 100th birthday, 2013 was the year of the Great Flood and 2014 will be remembered as the beginning of the new 21st century Calgary Stampede. The Calgary Stampede is truly one of the best annual festivals in the world. It is six major events all wrapped up into one mega extravaganza - Grandstand Show, Rodeo, Chuckwagon Races, Midway, Agricultural Fair and Music Festival. 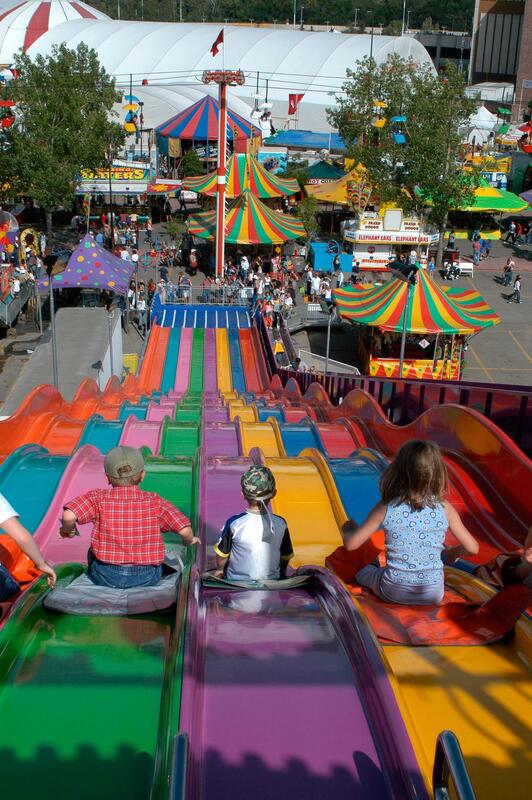 Stampede Park is not only one of North America's best and oldest urban Agricultural Fair sites, but also one of the largest, busiest and most authentic SHED districts (Sports, Hospitality, Entertainment District) in North America. Graceland has never been on my bucket list. But when in Memphis, it seems like the thing one ought to do and we got caught up in the hype. We, along with thousands of others, including bus loads of elementary school kids (shouldn't they be in school to learn real important things anymore?) arrived at the same time we did, which made for a long line up to get in. In Disneyesque fashion, we were channelled into holding pens where we waited our turn be herded through like cattle - 20 or so at a time on to shuttle buses. Not a good start! The mansion was not as grand as I expected. In fact, it isn’t as grand as many acreages or mansion in many cities in North America including Memphis. I was expecting some extravagant and futuristic home like something from a James Bond movie or a Jetsons cartoon. It is a stark reminder of just how our lifestyles have changed. What was luxurious 50 years ago is commonplace or even archaic today. As well, I need to keep in mind the house and décor reflected the tastes of a poor boy’s rapid rise to fame and fortune. The Billiard Room is completely draped in the cloth. Not my taste. The Jungle room was tacky, the kitchen was primitive and the bedroom would not be considered extravagant by today’s standards. It certainly lacked the castle-like sense of scale or opulence of a real King. How many gold records can you look at or how many outfits with flashy buttons/sequins with deep V-neck shirts and bell-bottom pants do you need to take pictures of? There is a whole room full of gold records. Just a few of the costume displays that you will encounter during your Graceland tour. There are lots of movie posters in the Graceland tour. Once out of Elvis’ Graceland homestead you are invited to view his Car Museum, Tupelo (his actual birthplace) History Gallery, two planes and several (surprise, surprise) gift shops at your leisure. There is also a diner which serves Elvis’ favourite sandwich - grilled peanut butter and banana sandwich, which I must admit, is very tasty. The Car Museum is good for a 10-minute walk through – what is it about rock and roll stars and their cars, especially Cadillac. The museum also has golf carts and a tractor - boy toys! The planes are a waste of time in my mind and in that of several others who we befriended on and after the tour. Yes this is the pink Cadillac. Some of Elvis' toys in the Car Museum. This is the inside of the Elvis plane. It is dark and drab with plastic over everything...nothing to see here folks, move along. Seems like you really should be an Elvis fan if you go to Graceland. One Chicago woman who was part of our tour, a self confessed Elvis worshipper, said she was moved to tears a couple of times. A friend who had done the tour a couple of days earlier and who is also a BIG Elvis fan was gaga about the experience. There were some surprises. Like I didn’t know he had a twin brother Jessie who died at childbirth and I wasn’t alone in this gap in my Elvis trivia knowledge. I was also not aware of the extent of his philanthropy. And who knew he had his own racquetball court? The racquet ball court with the horse pasture behind. As a former museum/art gallery professional, it struck me strange there are no real hands-on or interactive experiences. Where is the Elvis impersonator (or Elvis tribute artist as they like to be called) performing for you? What about a place to listen to his music and maybe a dance floor? What about “dance like Elvis” lessons? What about a karaoke opportunity to make you own video? What about a pink Cadillac with Elvis in the driver’s seat where you can sit next to him and get your picture taken? Maybe a place to dress like Elvis and take pictures? There is a tacky mural you can get your picture taken, as you line-up waiting for the shuttle but really, this is the 21st century. Interestingly, the tour also doesn’t tell the tragic story of the last years of Elvis’ life, which, while sad, should be part of the story. Elvis' is buried at Graceland along with some of his family. If you want to pay your respects, you have to come here. I wouldn’t recommend the Graceland Tour unless you are a diehard Elvis fan and that is not just me talking, I heard this same comment from several others. Take another look at the images in this blog and you have pretty much taken the tour. If you really want to understand the evolution of music in the 20th century the Sun Studio, Stax Museum and Rock and Soul Museum tours are well worth the investment of time and money. You will even get a good appreciation of Elvis' role in the shaping modern music and see lots of Elvis artifacts. Don't let the modest entrance to Sun Studios fool you, inside is wonderful tour with some of the best tour guides we have seen in awhile. The STAX Museum tells the most comprehensive story of 20th century music in a fun and engaging manner. CW writes: You made it to Memphis and face to face with the Elvis Conundrum - the beauty of rock and roll and the mess of his home are all the same piece. I believe the way into both is through his relationship to his mother, which you hint at when you mention his twin. Congrats on the visit. I hope to do it someday. I'm surprised that you were surprised by your visit. I think you were victim to the dictum: if you can't say anything nice, don't say anything at all. Tell me, were they selling the Guralnick bio volumes there? FYI, a really fun essay on the tackiness of Graceland and Elvis memorabilia is found in the book the Elvis Reader, where the author visits people digging through a metaphorical mountain of the stuff. Of course it's the people who are significant, not the stuff - just like the real Graceland. The Calgary boys - Tim Williams and Mike Clarke Band - are going to have to "kick-it-up-a-notch" if they want to win the International Blues Competition that started today at the New Daisy Theatre in Memphis. The Brat Pack from the Philippines set the bar high with a young keyboardist who could be this generation's Jerry Lee Lewis with his flying fingers and infectious smile and enthusiasm. The entire four person band was on fire, especially the keyboardist and drummer. The Brat Pack was the only group to get a standing ovation - not bad for a band where all the members are in their early 20s. The Brat Pack was one of two bands from the Philippines in this year's International Showcase. RJ Pineda enjoys the spotlight. His fingers were literally a blur to the naked eye. He didn't miss a note! The audience sat attentively. It was sitting on the floor room only. It is the uncommon blend of old and new that ultimately sets The Brat Pack apart from their contemporaries. Armed with their own unique style, a fusion of blues, jazz, soul, and pop, they can put their own unique spin on modern tunes, and slip comfortably into the tried-and-true standards of yesterday with ease. Bassist David de Koenigswarter, an Eric Clapton enthusiast whose family tree attests to the fact that music literally is in his blood, being the grandson of the famous Nica Rothschild de Koenigswarter, Pianist RJ Pineda, who you might remember as one of Promil’s Gifted Children, a child prodigy whose repertoire spans from Rachmaninoff to Ray Charles; Allan Abdulla, a St. Scholasticas Conservatory of Music, also a part of the Manila Philharmonic Orchestra who really takes his drumming to the next level at every performance and Christine Mercado, a spunky/charismatic vocalist who finished Music Production at the College of St. Benilde and has been singing jazz and blues since the tender age of 4. The Blues Powder Band from France was ranked second best by the guy from Kansas City sitting in front of us. He was more than willing to share his rankings with us. This was his second IBC and he said he was hooked after last year's experience. Lead singer Joe Elbaz and his Blues Angels from Israel put on a great performance also. The best band competition is going to be tough. Kicking off the festival was the International Showcase with 12 groups (solo, duo, bands) playing short sets over a three hour period. As expected, the quality of the music was very high; however the quality of the showmanship was a big surprise. The Blues truly has evolved into an international cult. What was even more surprising was the audience was almost totally white. I could have been in Calgary's Blues Can, Ironwood or Mikey's based on the skin colour of the audience. I couldn't help but wonder "What would Robert Johnson think about the international scope of the 21st century blues scene, if he was still alive?" The festival has been going on for 30 years, but it seems to have taken off only recently. I overheard someone say, "I have never seen so many people in this building." Canada is well represented this year. In the International showcase, Tracy K and Jamie Steinhoff from Thunder Bay represented us well, paying homage to Winnipeg's Big Dave McLean as their mentor and one of the most influential blues performers in Canada's blues history. Tracy K and Jamie Steinhoff represented Canada well. Flex Slim from Barcelona, Spain was a true blues traditionalist. We have also met lots of Canadians while flaneuring the streets of Memphis - Chatham, Winnipeg and Kitchener. On Thursday, the Ottawa Blues Society is presenting the Polar Bear Blues Showcase (great acts from the north), with the first 200 guests getting a complimentary "Canadian" beverage. The competition starts tomorrow, but already the event is a huge success in the eyes of the dozen or so Calgarians who are here ready to cheer on the Calgary Boys! The Jan Galach Band from Poland mixed strong vocals and violin harmonies.